SQL, which is an abbreviation for Structured Query Language, is a language to request data from a database, to add, update, or remove data within a database, or to manipulate the metadata of the database. SQL is a declarative language in which the expected result or operation is given without the specific details about how to accomplish the task. The steps required to execute SQL statements are handled transparently by the SQL database. Sometimes SQL is characterized as non-procedural because procedural languages generally require the details of the operations to be specified and writing data to file systems. 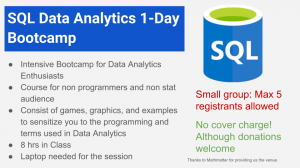 Sensitization to SQL Data Analytics and trends. Requires no knowledge of programming or database. Playing with missing data is the most important things and for that I will show five important commands. Missing data types: NaN, blank, 0 and how they are used. The more your reduce data before pulling the easier it would be do the computation. Utility functions for data cleaning, data ready for charting, avoiding looping, error handling will be explained. Essential Aggregate command, sub-TABLE, VIEWS and PIVOT. Exploring applications in Equity and CMBS (for linking all properties linked) Fixed Income Analytics. Optional: Data Prep for using SQL for Regression, clustering, Charting, Monte Carlo Simulation, Map Objects for Financial Modelling. Storing Monte Carlo Paths in SQL. Course Duration: 2-3 month, 10 classes of .5 hour each with 1 or 2 live classes each month. Introduction to SQL. Saving, organizing and reading simple data. Drawing Parallels with Excel and advantages over Excel. Project on SQL: SQL for structured Data Analysis depending on asset class. Example VaR using SQL. Using nested queries optimally. Getting ready for the next data revolution in Analytical SQL. Drawing parallels from Excel and how SQL can improve efficiency. Avoiding commands that will slow down SQL. Understand the basics of all major languages used for data handling in SQL, SAS and MATLAB. Understanding the importance of handling missing data, optimization of speed using novel methods. Formulas like V Lookup (and others discussed) make excel slower and hence such computations should be done in excel.